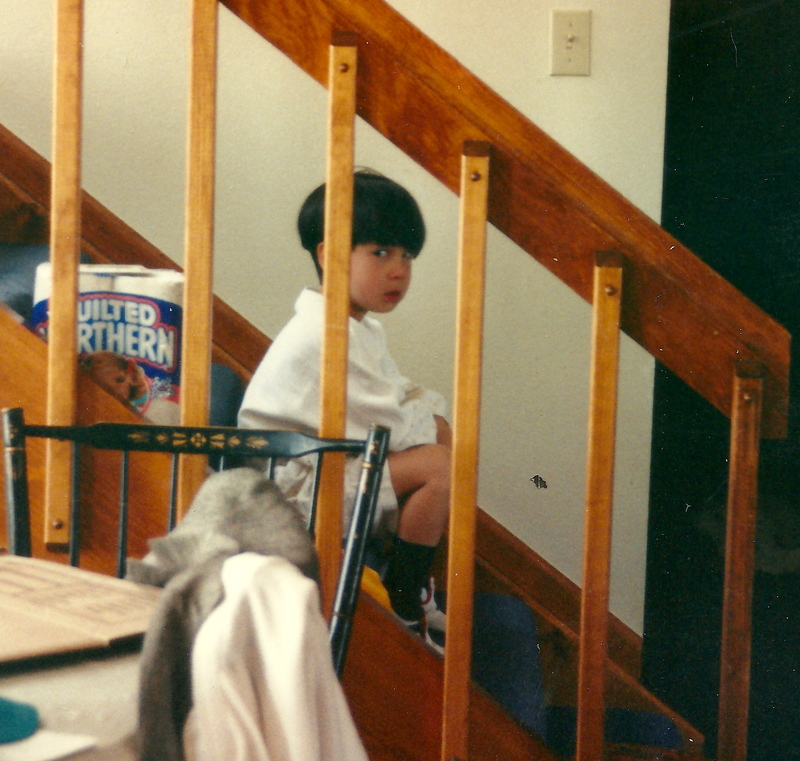 Boy on stairs, thinking about It. Boys are a mystery to me. I didn’t understand them when I was a teenage girl. I didn’t understand them when I married one. I didn’t understand them any better when I gave birth to them. My sons would do bad things I found incomprehensible. At first, I would go into another room so I could have a moment to try and understand why they thought whatever they’d done was a good idea. That strategy didn’t work out very well. While I was gone, they’d do something even worse. I started sitting them on the stairs, admonishing them to “think about what they’d done, then explain their actions to me.” I was not being rhetorical. I really didn’t get it. The first time I was faced with this situation happened in the back yard of my friend. Our two boys were playing with their trucks. Neil’s was red, Frank’s was yellow. Their childish laughter sounding like the music of angels. The ice in my glass jingled when I sipped my water. The sun was shining, my friend’s flowers were in full bloom. The day was perfect. Our reverie was broken by a heart wrenching YOWL and her son ran up to her, showing his arm. It was red and swollen. A bee must have stung him. But no. There were teeth marks. He pointed to my son, sobbing. Neil was red faced, shaken up by the commotion he’d caused, yet unapologetic. He had his red truck under his arm, pointing at Frank. The accepted rule of thumb was that if your child bit another, you should bite them to show them how it felt. I had been told this by my mother, my friends, anonymous women in the grocery store who felt compelled to talk to me while I waited to pay for my food. Dutifully I grabbed Neil’s little arm and prepared to do the right thing. I felt the smooth skin of his wrist, smelled the baby soap as I brought it close, saw the trust in his eyes. I pushed the females voices from my head and put his hand by his side. My friend was kind but it was time to go. I gathered our stuff, put our dishes in the sink and left. Neil twirled the wheels on his truck as thoughts rolled through my head. That was when I decided that people who loved each other didn’t bite each other. It seemed to me that one of my duties as a mother was to teach my boys how people who loved each other treated each other. From that they would know how to treat their friends. How to treat their acquaintances. How to treat people they didn’t know. I never bit any of my children. However, they did spend a lot of time on the stairs.